I'm back for another Whimsical Wednesday Challenge! Here's a looksy at what I created for some inspiration! It's a pincushion! I made the bottom part out of chipboard using the Sizzix Candy Cups die. It was painted using a Ranger acrylic dabber in Denim and then coated once with Denim Dimensional Pearls for a bit of shimmery goodness. The sides are all decorated with a layered snowflake I went absolutely CRAZY for this past holiday season. I made TONS... seriously. :D The very front is decorated with a sentiment from Whimsical Designs "Snow Much Fun" stamp set. I thought I wouldn't get an opportunity to use this set anytime soon, and so I'm just sooo happy I did get to use it! :D For the trims, I just used some twisted white cord and chain from my holiday ribbon stash and some thin white satin ribbon on the bottom. I used a necklace I had gotten in a RAK from my friend Donna as a chain swag and added a charm and pearl to the end where the clasp is. Have a great day! And thanks for stopping by! Good morning my fellow crafty friends! Today is the beginning of a new Whimsical Wednesday Challenge! Yay! This mailbox is completely made from scratch out of chipboard! Not bad for my first time, if I do say so myself! ;) It's about 4" tall, 3" wide, and 4" deep - so altogether not to big and not to small. There's a matching itty bitty mini that goes inside, but that's another project to show you another day... ;) hehehe! To construct the mailbox, I used part of the Tim Holtz Vintage Cabinet Card Die as I am absolutely HORRIBLE at creating curves and circles free-handed. Plus, I could cut the paper for matting the sides absolutely perfectly every time! Bonus! :D The rest of the mailbox was just putting the pieces together - easy peasy! This is one of the cut-outs from the A4 paper sized pad. Awesome vintage feel! It's popped up on a redish-pinkish circle I cut out from the paper line and then matted on a black doily I die-cutted from a Spellbinder's die and then spritzed with "Sugar-Fairy Plum" Glimmer Mist. I just LOVE the shimmery-ness! I added some I Am Roses flowers to a couple of the corners and a couple of glittery butterflies. Pretty neat, huh? :D I'll be putting up a video later when I get my voice back from my silly cold! So... I hope you enjoyed and got some inspiration from this! 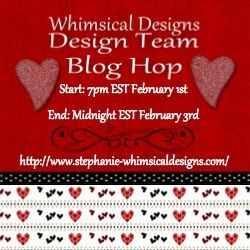 Don't forget to go check out the other Design Team members' amazing projects over at the Whimiscal Designs blog and join us for this fun, fun challenge! More information about the details for this week's challenge and the prize you have a chance at winning if you enter will also be posted over there! :D Hope to see you there and I just can't wait to see what ya'll create! So meet the rest of the team!